" Nightingale of India" , " Voice of the Millennium" , " living legend" -- all these descriptions sit very lightly on her shoulders. Lata Mangeshkar celebrated her 75th Birthday a few days ago. Her treasure trove of songs & sheer variety leaves one breathless ( Not to forget a Career Span of almost 60 Years of singing). Despite allegations of Rivalry & not allowing other singers to grow ( Especially Asha,Vani Jairam,Anuradha Paudhwal) & her constant tiffs with bigwig music Directors ( She never sang for O.P.Nayyar & had big showdowns with Shankar-Jaikishan,S.D.Burman,L-P,Mohd.Rafi at various phases in her Career) , there is no denying the unalloyed sweetness of her voice and her amazing versatility . As someone, Who is a big Hindi film music buff , I hereby try to present my Favorite 10 Lata Solos. Its a very tough job to pick 10 best songs amongst her thousands but I have tried to do a balanced job. I have chosen only Solos and not duets. 1. Yeh Zindagi usiki hai ( Film : Anarkali , Music : C.Ramachandra) This is perhaps one of the best Solos of the 50's.Lata has sung the song beautifully.She scales the higher Octaves with ease in this song. 2. Pyar Kiya Tho Darna Kya ( Film : Mughal-e-Azam , Music : Naushad) Is there something new I could say about this song ? An all time favorite,it is a sheer magic of Picturisation & rendition. 3. Aaja re Pardesi ( Film : Madhumati , Music : Salil Chaudhury) The unalloyed sweetness of Lata's voice & the haunting tune makes it one of my favorite songs. Salilda's score for Madhumati (& Anand) is unforgettable. 4. Rasik Balma ( Film : Chori Chori , Music : Shankar-Jaikishan) A wonderful classical song based on the Raaga " Shudh-Kalyan" . Lata's association with S-J produced many memorable solos & duets. 5. Aapki Nazrone Samjha ( Film : Anpadh , Music : Madanmohan) I doubt if any other singer could have done justice to this song . A vintage Lata-Madanmohan song.I was amazed the first time I listened to it and continue to be amazed everytime . 6. Jo Humne dastaan ( Film : Woh Kaun Thi , Music : Madanmohan) Another gem from Madanmohan. Haunting melody and Lata's voice is soothing.This movie was remade in Tamil too ( I think Jayalalitha was the Heroine and the movie was titled " Yaar Nee"). 7. Aaj Phir Jeene Ki ( Film : Guide , Music : S.D.Burman) Guide had fabulous music by one of my favorite music directors -- S.D.Burman. This Song has a very unconventional start (Began with the Antara )and perhaps that makes it all the more appealing. 8. Na Koi Umang ( Film : Kati Patang , Music : R.D.Burman) One of the best sad solos of Lata. Panchamda has composed a great score. K.Balachander used this song very well as a background hanting melody to convey the sadness of his heroine in one of his Tamil movies. 9. Megha Chaayi Aadhi ( Film : Sharmilee , Music : S.D.Burman) Wonderful music. The song has a long orchestration music and starts chirpily but then takes a sudden tonal change to loneliness. 10. Diya Jale ( Film : Dil Se , Music : A.R.Rahman) One of the last " great" songs of Lata. Her voice still had the magic and the Mallu " Chorus" makes the song all the more special. Received this email from one of my Humor Newsgroups. 1. A man who shovelled snow for an hour to clear a space for his car during a blizzard in Chicago returned with his vehicle to find a woman had taken the space... Understandably, he shot her. 2. After stopping for a drink at a bar, a Zimbabwean bus driver found that the 20 mental patients he was supposed to be transporting from Harare to Bulawayo had escaped. Not wanting to admit his incompetence, the driver went to a nearby bus stop and offered everyone waiting there a free ride. He then delivered the passengers to the mental hospital, telling the staff that the patients were very excitable and prone to bizarre fantasies. The deception wasn't discovered for 3 days. 3. A mother took her daughter to the doctor and asked him to give her an examination to determine the cause of her daughter's swollen abdomen. It only took the doctor about 2 seconds to say, "Your daughter is pregnant. "The mother turned red with fury and she argued with the doctor that her daughter was a good girl and would never compromise her reputation . The doctor faced the window and silently watched the horizon. The mother became enraged and screamed, "Quit looking out the window! Aren't you paying attention to me?" "Yes, of course I am paying attention ma'am. It's just that the last time this happened, a star appeared in the East, and three wise men came. And I was hoping that they would showup again. Suddenly this voice is being heard everywhere. The Indian PM's top agenda during his recent tour abroad was to solicit Support for India's Bid to UN Security Council (As a Permanent Member). As the World's largest democracy & the second most populous country in he world (Apart from the fact that India is one of the fastest growing economies in the World with an increasing footprint in the Globalization ), many feel India rightfully deserves its place.Also we have always eschewed War and believed truly in Non-violence. Russia,UK,France have already expressed their support to India's candidature. However , the US & China have yet to voice their opinion on this issue (Though there are Indications that China may Oppose). Japan,Brazil,India & Germany have announced mutual Support to each other and want all the four nations to be part of an "expanded" Security Council. The biggest opposer to India's Candidature, needless to say, is Pakistan. Most of the Indian Media has been backing its candidature with HT (Hindustan Times) running a Special on its website. India has also surprisingly found a lot of support in the Western Media ( Washington Post , New York Times ). Also found a few online signature petitions ( Is this the Gandhian way in the e-world ? ) at Sulekha & Petitiononline. Though US's treatment of UN during the Iraq has left a lot of doubt about the functioning of UN, there is no doubt about the power a country enjoys by being in the UN Security Council. Many are questioning the unchanged composition of the UN Security Council Since the end of second World war when so much has changed in the real world.This is perhaps the most objective reason for inclusion of new world powers like Japan,India and the rest . As a Travel Lover , Tourism is one of my favorite topics. As someone who has widely traveled in India , I feel the potential we have to attract tourists is huge. The amazing Cultural & Physical diversity of the Indian sub-continent never ceases to amaze even the most cynical traveler. However, Unfortunately tourism is a largely unorganized,orphaned ministry/dept in India . The Environmental,Cultural,Spiritual Diversity is bound to attract millions of tourists if properly marketed and operated.The government needs to work hard to develop proper infrastructure and market it. I was not surprised to read in Conde Nast traveler , that India has been Voted as the 6th most preferred tourist destination in the world. We have the potential to be among the top 3 in the world. But do we have the Will to do it? I was pleasantly surprised to see an impressive Official Website of Ministry of Tourism. The Millions of NRI's abroad also need to do their bit by spreading awareness about the diverse tourist attractions in India. The Govt needs to preserve our invaluable monuments,Build good roads,modernize Airports and other modes of Transport,Organize Road shows abroad & create an atmosphere which welcomes tourists. Can all this be done when there is so much to do for the poor & unemployed ? If Bollywood can burn Crores of Rupees over inane movies & If " India Shining" campaign cost the Govt Crores of Rupees ( Not to forget the Bribes & Scams of the past) , Why can't this be done ? I couldn't have asked for a better companion. I was traveling from my Business School to the Executive centre ( a Bus Ride of 40 minutes) in the School Bus. The seat next to me was vacant and Ali came and sat next to me. I knew his name was Ali, having seen him in my Finance Class. I said Hi to him and asked where he was from .He said, " Islamabad,Pakistan" . I told him about my great admiration for the Pakistani Ghazal music and " Mehdi Hassan" being one of my favourite singers. He was surprised that my mother tongue wasn't Hindi (he thought entire India speaks Hindi ) & asked me what Madras was famous for. " Marina Beach,Silk Sarees & carnatic music " I told (Not sure if madrasis agree with my view). I asked him where he used to work. " Pakistani Foreign Ministry" , he replied. This got me hooked. We debated then about the foreign Policy of both Countries,India's right to entry to UN Security Council, Kashmir problem and India's booming economy. Though he was non-commital on most topics,I felt pakistan feels Kashmir is as much theirs as we feel its ours.He was apparently an admirer of Gen.Mushraff and even felt benevolent dictatorship was good (Thankfully , he didn't see the Book "1984" by George Orwell in my Hands ! ). He asked me an unforgettable question when I was about to get down , " Who is Bal Thackeray & where does he live ? " Its an addiction most techies (and a host of others) suffer from. The addiction to spend long hours on the internet. Ever since I bought a laptop here , I have fallen a victim to this addiction too. There is no doubt that Internet is great , with so much of information and connectivity to friends & relatives. However,If I look at Being Online more scientifically , I define a "threshold time" on internet . Beyond the threshold time whatever time I spend online results in very less value addition. But every time I keep Breaking my " Threshold Time". I remember a roomie of mine who always used to be online on messengers at work and used to come back from work and immediately (Without even having refreshments) go online again at home.Different people have different sub addictions.Some are addicted to messengers , Some to News sites,Some to online games,Some to emails,some to blogging (? ),some to newsgroups and so on. I was surprised to read about an institute which offers counseling to internet addiction. So my birthday resolution (Today is my birthday ! ) is not to exceed my "Threshold time" from now on. Thanks to the student committee , I got a chance to do some Volunteer work for the Children's Cancer Foundation , Singapore today. We sold Pins & Tulips, the proceeds of which went to the CCF. So I did some hard-selling at the Cafeteria and managed to raise a considerable amount of money. It is always a great feeling to help a noble cause. Perhaps my biggest Value add at CSC , was my involvement in community work and close interaction with the NGO's.May Social responsibility thrive ! The University (and the Student association) is doing a great job in arranging talks & seminars . Every week we have at least two good Seminars/Talks . In fact right now I am supposed to be at Philip Kotler's Talk on Marketing but unfortunately the seats were limited and I couldn't get a seat to that talk ( Kotler's loss ! ). Today afternoon we had a Talk on " Venture Capitalism" by the Chairman of Singapore VC Association. It was an interactive session . The reason why I asked that question is this : I used to work for a start-up in the Silicon Valley.Another big co wanted to buy us out. But our management was unwilling since we were doing well and capable of growth.However, the VC's, since they were offered more money sold us out and our product got killed by the acquirer (Through shoddy management and poor understanding of the product) and the entire current management got laid off. Later the acquirer got into an accounting fraud and paid heavy penalties and sold off our division to another company for peanuts. So a perfectly young,good start-up got killed by the greed for quick money by the VC's. Btw, found this nice pdf on VC in the web. The Big Daddy answers the big question. Here is an article from Mckinsey Quarterly which answers the question " The world’s two biggest developing countries are taking different paths to economic prosperity. Which is the better one?" . As always they have done an excellent unbiased job. 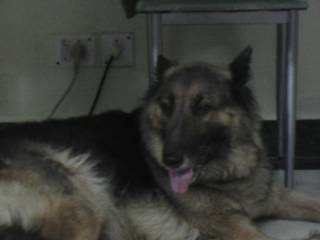 And then there was Silence.When my mom called me up yesterday and said teddy looks to be dead,I was numb with shock .After a long time I cried yesterday.Our Dog, Teddy(German Shepherd) died yesterday. After being with us for almost 10 years ,the end came yesterday. She was apparently active even 10 minutes before she died and the end came suddenly by a heart attack.Needlessly to say everyone in my family is in tears. If there are two words to describe a dog it would be -- Unconditional love.She has always been a member of our family always wagging her tail,demanding her biscuits,jumping all over us and loving her walks with us. Though I have been guilty of only making occasional visits to chennai in the last 7 years,teddy has always been in my mind and she always had my undidvided attention when I was there. As John Lennon famously said " Life is what happens to you while you are busy making other plans" . While I was busy scripting my career wandering over Countries & cities , I missed the whole fun of being at home and enjoying a sedate life.More than anything I missed a great opportunity of being with teddy. Death always brings a multitude of emotions.It starts with being angry at god,then a passive admission of the realities of life often bordering on philosophy.The images flashback before you.When my grandfather(Thatha) died a few months back almost the same thing happened. Images of teddy flashed back before me as if it was yesterday.The day when she came as a one month pup to us --- I named her" Teddy" since she resembled a teddy bear --- The days before we "toilet-trained" her ,she used to make a mess all over the house --- Her distaste for rice --- Her love of biscuits & carrots ---The day she delivered 7 pups --- Those two months when we had eight dogs (Teddy + 7 pups) and my travails feeding them & cleaning up their mess ---Those few months I fed teddy Beef at doctor's insistence( Inspite of me being a pure veggie) --- The days when we used to play hide & seek with her.With her keen smell she used to find us in a few seconds --- The morning walks I used to take her --- Her inquistiveness of anything & everything on the road --- Her love of people and constantbarks of joy and licking us all over our face --- Her love of AC and the way she used to barge into the Bedroom as soon as the AC is switched on --- Her love for all things --- She lived a great ten years and perhaps enjoyed most of it and finally decided it was enough.May teddy's soul rest in peace. All these images flashed through me yesterday and then there was Silence. Is she the modern day Midas ? Whatever Oprah Winfrey touches becomes gold.She holds a sway over talk show viewers across the world. The mere mention of a book in her show guarentees it sales of thousands (Anna Karaneina has suddenly become a best seller again after a favourable mention in her show). Listen to this story.All 276 people who were part of the audience on the talk show a few days back got a GM Pontiac Car thanks to a surprise marketing campaign by GM(Holy cow!!). Apparently the hits to GM's Pontiac website have increased eight fold since the show. Read the detailed report on CNN Money. Last few days have been hectic since I had to make Case presentations in Economics & Finance ( Hurrah , I am finally thru with my presentations for all subjects ! ). The Finance case was on Risk Analysis in Capital Budgeting ( Is there a topic which can be more dry than that ? ) . My Macroeconomic case was on the " Impact of ICT (Information & Communications Technology) on Macroeconomics" . To start with I reverse my opinion (Contrary to my earlier post where I found Microeconomics to be too Abstract) on Economics. Macroeconomics is one the most interesting subjects you can ever read. As I dug more into the effects of ICT on Inflation,Unemployment,Productivity & GDP , the more I understood the economy of Nations ( And the more my respect for Alan Greenspan grew ! ). My prescribed text book in Economics ( By Gregory Mankiw) is an excellent book . (Although I keep wondering how an economics book would look if written by a communist ! ). 1. Economics is the painful elaboration of the obvious. 3. If you laid all the economist end to end, they would never reach a conclusion. 4. Economists have forecasted 9 out of the last 5 recessions. 4. Sound of Silence ( Can't think of a better tribute to this song. The Song is one of my all time favourites (by Simon-Garfunkel) and the photos are awesome). Found this interesting one-liner on Education. That the premium B-schools in India have a bias towards engineers is a known fact .Was reading an article in Rediff which talks about this phenomenon and subtly questions the method of Selecting "the 'brainiest' and then grooming them towards a management career rather than selecting the brains best suited for the purpose". I know engineers will find this argument quite difficult to accept .There is no doubt that engineers are very good at math & quantitative analysis. But the flip side is that engineers have "Boxed" thinking and in most cases poor Social skills (Btw, I am an engineer doing an MBA too).The article (Though not in great detail) analyses this trend. The author herself is an IIM-A Alumnus and runs a cool website (and a youth magazine) called JAM. Veer-Zaara is a Yash Chopra film which is going to be released during Diwali (*ing Sharukh Khan,Preity Zinta,Rani Mukherjee). So What is unique about its music ? The Music for the movie has been composed by the famous music director Late Madan Mohan . It has been almost 30 years since Madan Mohan died. His unused tunes have been preserved and been used in this film (If I am right his son Sanjeev Kohli has recreated the music).Lata has sung almost all the songs. Hindi film music lovers can never forget the Madan Mohan-Lata classics. Madan Mohan is one of my favourite music directors and hope the new film revives his magic.I remember being besotted by his songs like " Aapki Nazrone Samjha" (Anpadh) , "Tu Jahan Jahan Chalega" (Mera Saaya),"Jo Humne Dastaan (Woh Kaun Thi),"Bhayya Na Dharo"(Dastak),Dil Dhoondtha" (Mausam) , all peerless melodies of Madan Mohan.Unfortnately he never made it big in Bollywood although his songs were hugely popular. I remember writing a post on him when I was in the US , in one the Usenet Music Newsgroups.One of my treasured possessions used to be an HMV " Golden Collection of Madan Mohan" cassette.Hope the music of Veer-Zaara lives upto the reputation of its illustrious composer . Blogger has come up with a few cool tools . The first is the ability for someone to email posts which he/she reads in a blog. The feature just needs to be turned on in your settings and anyone who likes your posts can now email it to a friend.This helps in increasing the popularity of both Your site & Blogs in general (I enabled it in my blog recently - You will see a mail sign at the end of all my posts ). Second is a tool called Adsense which allows bloggers to make money by featuring relevant Ads.I haven't tried this yet though. Blogging now seems to be entering the next phase and after the dot-com bubble , I am sure it would be a measured one. Have you ever wondered why goods are always sold at $49.99(not $50) or $999 (Not $1000) ? Perhaps the easiest explanation is the psychological fact that the consumer's mind thinks that $49.99 is less than $50 (Though in strict quantitative sense the difference is immaterial). * "I believe that the origin of 99-cent pricing goes back to JC Penny to keep his employees honest." (Various other readers cited Mr. Macy, Mr. Woolworth and Mr. Sears.) "At 99 cents, they would be forced to open the cash register to give change. When the price was an even dollar, employees would be more tempted simply to pocket the bill." * "I believe you can trace the origin of these sales to William Randolph Hearst. In the days when one cent would buy something concrete in a store, newspapers sold for amounts like 3 cents. Hearst encouraged advertisements from the major department stores, and told his staff to push the concept of prices at odd amounts in order to ensure that there was a good circulation of small change so that the public would be able to buy his papers." Of course the other Scam is that in some countries (Like US - Perhaps because of varying taxes in different states) its not inclusive of Sales Tax and hence understates the actual price one pays.However in UK,Singapore the Sales tax is included in such prices. He finally got the respect that was due for him (Thanks to the Jury which did not make the Lunatic decision of giving it to Hrithik for Koi Mil Gaya). He has been phenomenal in the last five years in Tamil Cinema churning out Hits after hits and walking with ease the thin line between Commercial Cinema & off-beat movies. He had done a commendable job in Pithamagan (Though Surya had done a equally good job too) for which he got the Best Actor Award. People call him the next Kamalhaasan. Here is a profile of him by The Week. A wonderful piece of article from Mckinsey Quarterly exploding the myths of offshoring.The article argues its a win-win situation for both countries (US & India) due to offshoring . The article traces the flow of a Dollar and quantifies the benefits to US & India (or China) .A must read for all who are part of the Outsourcing / offshoring Juggernaut.